This International Women’s Day – HRF aims to highlight the difference its donors make for women around the world. Our work looks beyond equality and takes a gender-equitable approach. HRF engages in contexts where women are often disadvantaged through a combination of cultural sensitivities and socio-economic barriers by ensuring we prioritise equity, rather than solely equality, we focus on issues such as access and cultural appropriateness. For example, our water supply programme with UNICEF in Mosul, Iraq, focused on utilising vulnerability criteria, where we ensured women-headed households were targeted first by water trucking. Although not obvious at first, by delivering to households directly, women without access, either due to domestic duties, or cultural implications, received water. Whereas this may not have been the case if water points in streets were solely our solution. Instead, we adopted both options and provided all water trucks with gender-sensitive call cards, that households were provided, so complaints and feedback could be provided to a third party agency. This is just one example of how HRF puts women at the centre of its programmes, to empower them in environments where they are disempowered. We recognise education not just as an opportunity but as an obligation for everyone. Everyone, regardless of their status, belief or background, has the right to adequate education. This is why HRF has empowered girls with education through its Iqra Project for many years. 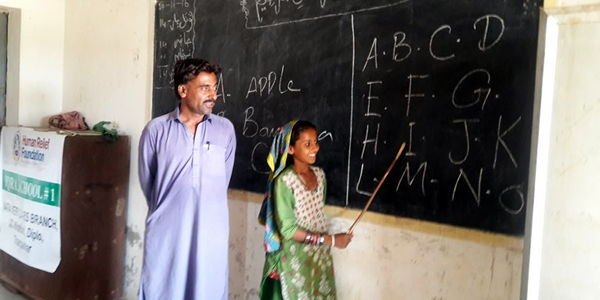 This project is based in Pakistan and targets poor illiteracy, which is under 10% in rural areas. Girls who do not receive an education are more likely to be exploited or forced into slave labour when they become adults. From our permanent offices in Islamabad and Isakhel, HRF identifies children most in need of an education and change their lives by enrolling them back into school. 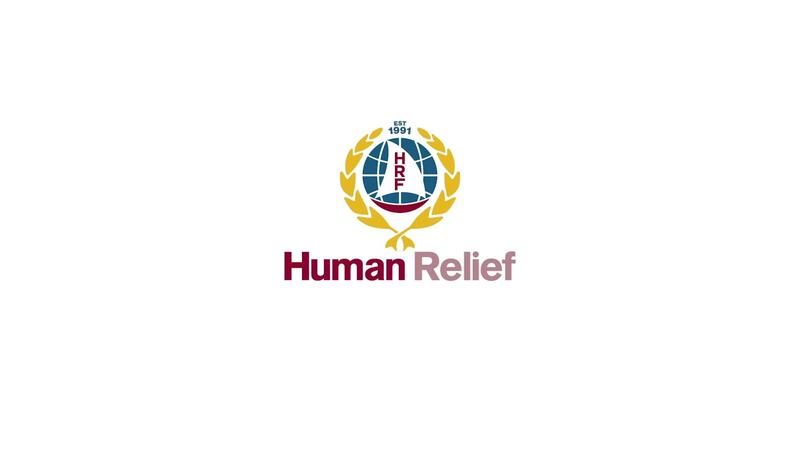 HRF has also built and refurbished schools and educational facilities in poverty-stricken areas where the gender gap was high. 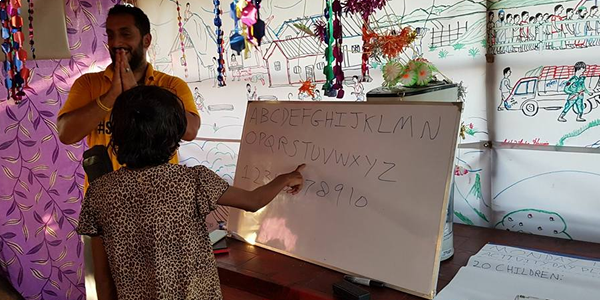 Examples include the building of school complexes in Ghana, and the construction of child-safety zones in Rohingya refugee camps in Bangladesh where both boys and girls are taught basic education. 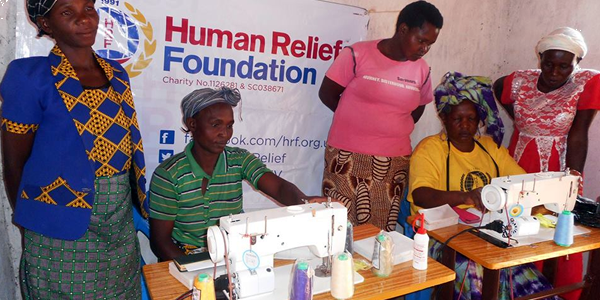 HRF’s Support For Life project aims to give families living below the poverty line in Kenya and Pakistan, the opportunity to be able to generate income, learn skills, and gain a sustainable future. Hundreds of women have already benefitted from this project, having received the vital tools and training to sustain themselves with money made through the sale of the items. Such as tailoring units delivered to beneficiaries in Kenya who sold numerous textiles such as dresses and hijabs to their local community. HRF has also delivered tailoring units to Rohingya women who have fled their homes in Myanmar. Living a new life in Bangladesh, tailoring units have provided them an opportunity to create garments and earn a living. These are just some of the many projects and programmes that donors have supported over the years. HRF believes and has always believed in the equal value of women, girls, men and boys, and the importance of equity in treatment of all people, regardless of their status.